The Adrien and Hughes Group has years of Real Estate experience in Residential, Commercial & Leasing. Throughout their years in Real Estate, they have had the opportunity to work throughout Greater Boston. 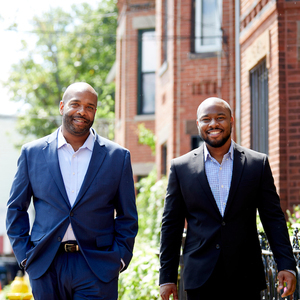 Jamal Adrien and Damond Hughes have an abundance of knowledge as well as current market data for Boston, Cambridge, and neighboring communities. They are true real estate professionals providing their clients with the best customer service. Jamal grew up in the real estate business, learning the business from his father at a young age. During his time in the business, Jamal has established relationships with many of the cities top developers and investors. However, Jamal's greatest attribute is as a trusted advisor. Whether in an off-market transaction or submitting an offer for your first home you can count on his aid throughout the entire process. Damond gained a wealth of knowledge managing his families commercial and residential real estate portfolio. This experience has allowed him to be a trusted advisor to landlords and investors throughout Boston, Cambridge, and surrounding suburbs. His background in education and his patience in guiding you throughout the entire process creates an experience which benefits both Buyers and Sellers. Their goal is to provide the best professional, ethical and effective service. You can count on their support in selling or buying your next property. With their extensive network of contractor, developers, investors, and finance options the resources available to their clients are limitless. They look forward to giving you the best resources and commitment you deserve.